Americans are receiving a defective product from the U.S. Congress, and it costs us in countless ways every day. The backwards rules in the system are the strongest drivers of this appalling performance – far more so than our individual representatives. 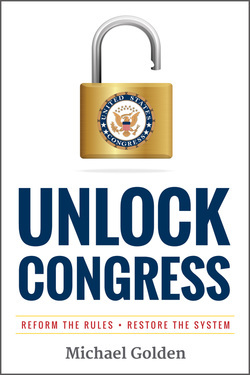 Unlock Congress is a new book and non-partisan effort geared toward reforming the rules, in order to steer our warped congressional process back onto the rails. Chicago Sun-Times Columnist Carol Marin Calls UNLOCK CONGRESS a Must-Read: "It offers a vial of vaccine for the diseased politics that is crippling us." Michael Golden’s Unlock Congress is a memorable cry from the heart about the dysfunction in Washington. In this beautifully written, highly readable, and notably well-researched book, Golden points the way toward real-time steps for congressional reform. Whatever your partisan affiliation or political philosophy, you will be stirred by the realizable vision of Unlock Congress. In his analysis of the “money flood,” Michael Golden has taken one of the most complex and challenging public policy issues of our time and distilled it into a clear and compelling narrative that should stir the public to action. A great summary of a debilitating disease afflicting our democracy. We currently have a republic that is not representative of, nor responsive to the general public. Unlock Congress outlines various contributing factors and offers several potential solutions to help revitalize our system of governance. In Unlock Congress, Michael Golden artfully takes us on a historical journey, offering readers a clear understanding of the dysfunction that is crippling Congress. When the essential needs and rights of the masses are controlled by the self-interest of a few, systemic change is the only alternative. Golden’s gem is a must-read for political junkies and all Americans who seek the bright futures that our founding fathers envisioned. If you want proof that the system is broken, this well-researched book will convince you. If you are already convinced, but want practical solutions, Mr. Golden delivers on that score as well. Unlock Congress is essential reading for students and educators, especially those who have lost their faith in our government and are looking for ways to improve it. Golden offers real answers and inspiration. Michael Golden's Unlock Congress provides precisely what it seeks from Congress: deliberative, historically-grounded, and well-reasoned policy prescriptions as to how a free society should be governed. I do not come down on the same side of every issue Golden tackles but the quality and manner of his arguments prompt my reflection and compel my respect. Golden's Unlock Congress is an important contribution to an overdue discussion about the structure of Congress and the rules of the game that determine its form and function.